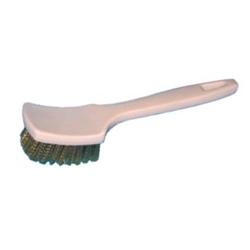 Foam Plastic Block Brass Wire Brush BOWES SS 37010. Filling material is staple set in foam plastic block that will not crack when left in tire cleaning solution. No. of rows: 8 rows x 7 rows. Length of Trim: s inch. Block size: 8½ inches long.